An irresistible novel that “charts a harrowing tour through the Civil War” (Connecticut Post) and chronicles the life of Tom Thumb—the tiny man who became, in his time, America’s most famous entertainer. “I was four years old when Barnum discovered me, and soon to turn five when I first appeared on the big stage of his American Museum.” So begins the story of Tom Thumb, who at just twenty-five-inches tall, rises to global fame as America’s most beloved entertainer. With his parents’ blessing, Tom comes of age in Barnum’s five-story gallery of oddities, exploring its mystical artifacts and exotic animals between his performances to sold-out crowds. One day in the museum’s basement menagerie, Tom meets a new performer, Lavinia Warren, who stands three inches shorter than he. It’s love at first sight, and Barnum quickly arranges the largest wedding reception New York City has ever seen. As cannon fire echoes across Bull Run and Antietam, both North and South are briefly united by their fascination with “General” Tom Thumb and his beautiful, petite wife. Despite the Civil War, Tom and Lavinia embark on a honeymoon tour, where they encounter cities and people ravaged by the ongoing conflict. But as the tour winds down, an unexpected danger follows Tom and Lavinia back home. 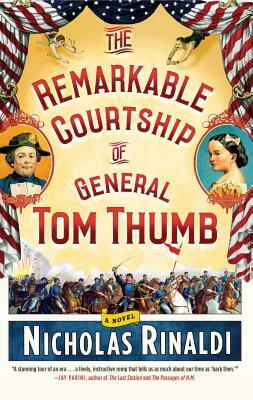 Witty, lyrical, and with a colorful cast of notable figures of the period, The Remarkable Courtship of General Tom Thumb is an evocative, poignant imagining of one man’s story, from a “master of elegant prose and psychological insight” (Entertainment Weekly). "Imaginatively blends fact and fiction... Top-notch entertainment." "In exquisite counterpoint, Rinaldi's book makes history live again in accounts of the Civil War and that of Barnum and the unforgettable General Tom Thumb." "Rollicking. . .Rinaldi also illuminates the Civil War backdrop to great effect. . . history lovers will find plenty here to appreciate."